Puppies – we have them (or, had them), they’re cute and cuddly and often become wonderful members of our families. However, we sometimes forget the hard work and time spent that goes into training and housebreaking them. No matter how steadfast we remain in the training routine, accidents are bound to happen and we realize this here at Bayside Carpet Cleaning. Because we understand if you currently have, or are considering bringing a dog into your home, it’s probably a good idea to known how to remove a good urine stain from your carpet. Although old urine stains cannot be removed from the carpet unless they are cut out, stains that have appeared within a couple of hours can often be cleaned with good success. This can be accomplished by using a 50/50 solution of white vinegar and water, followed by blotting with water only. After this, absorb the spot with clean colorfast towels until it is as dry as possible. Next, place a one-half inch thick weighted layer of colorfast towel over the spot and let it sit overnight. This final procedure must not be overlooked since crystallized urine residues left in the carpet are capable of reproducing odors during the warmer more humid months. Older urine stains often require replacement of the part and pad in the affected areas and can also necessitate cleaning the sub-floor with a disinfectant. 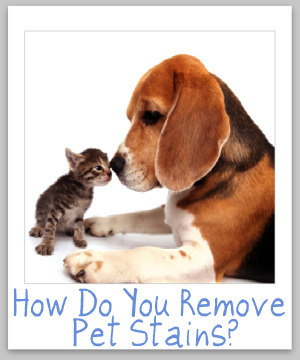 Having pets is a true labor of love, but we hope we were able to help you in keeping your home more stain free. In the event you were able to remove the stain yourself, please reach out to us and we’ll be out with a solution for you!